At the end of May, 1994 I was a month away from graduating junior high school, desperately hopeful that my awful perm would disappear by summer and excitedly cheering on the Vancouver Canucks alongside my brother and my dad. BC’s hockey team was on their way to the Stanley Cup Finals for the first time since I was in diapers. 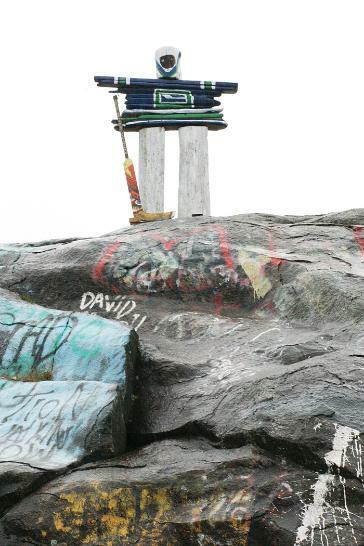 Campbell River – The famous “Big Rock” on the shores south of Campbell River have become even more noticeable after local resident Steven Ordano constructed a Canuck-shuk made of local driftwood and resembling hockey hero Roberto Luongo. Visitors to Campbell River will have no doubt that the seaside city is bursting with Canucks fans! Victoria – Canucks fans in Victoria can be a part of social media history this evening as three local mega fans – Alex Hodgson, Jeff Thompson and Chika Murugiah – are creating a tribute video for their beloved NHL team. Don your Canucks gear and head to Sopranos Bar & Grill at 730 Caledonia Avenue to show your support. Visit the Facebook event page for more information. Is your Island community sharing the excitement over the Vancouver Canucks’ run for the Cup? Let me know and I’ll post the event here!